How can members customize a prescribed box? 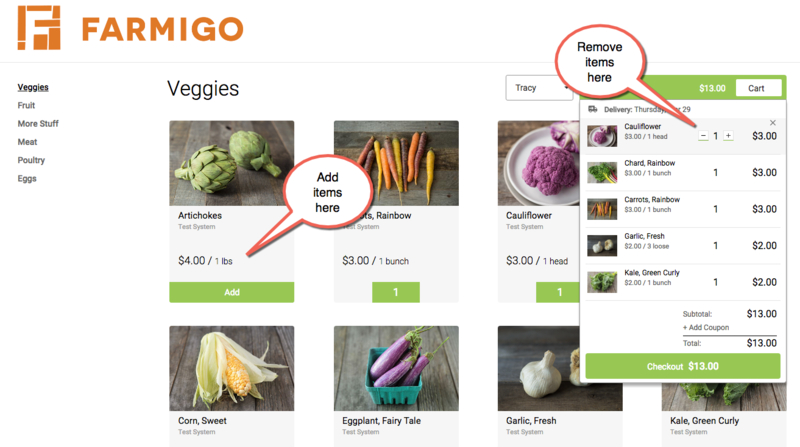 If you would like to give you members the option to edit the contents of their box, you can configure your Farmigo system to offer prefilled editable store orders. With this model, you can prefill your members' store orders and then they can log in to edit their order through the web store. What are the required settings for this model? How does this model work? When the member signs up to your program, they will select their share and their payment plan. You may offer your members different box types by creating shares based on the default contents, such as meat and/or vegetables, or based on size. These box types will define the default box that members will receive if they don't customize their order for a specific delivery. Because members will be charged for their store orders, share prices are set to zero dollars so that members are not charged for both their store order and share. Support can work with you to define the unique payment plans and pricing for your program. Prepaid Credit - Members will put a certain amount of credit on account with you. Each delivery will be deducted from their balance on account. Debit on Delivery - Members will be charged for each order on the night of delivery or you can pre-charge by a set number of days in advance of the delivery. A. You may create orders up to 6 days in advance of a specific delivery date. The orders will be filled immediately upon click "create orders". B. Or schedule the orders to be automatically created once the store is open for that delivery date. This option can be used if you need to schedule the system to create orders over the weekend or a day you won't be in the office. * If you schedule the orders, you cannot unschedule them, contact support if a scheduled order needs to be removed. Once the create orders has been completed or scheduled, any changes to the box builder won't be reflected in member's orders. For example, if you create orders for the example below, then remove artichokes from the box builder, the members will still have artichokes in their order. If a member already has an order in their shopping cart for this delivery date, the system will skip their order. To edit their orders, members log into the web store through their account and the direct url. What you need Harvest/Source: To know how much of each item you need to harvest or source, use the Distribution report or the Upcoming Store Orders report. What if I also offer shares and options that are not customizable? If you also manage shares and options that are not customizable, take the following steps in order to generate an accurate Sourcing Breakdown report that will help you to know what to harvest and source for all shares and options. 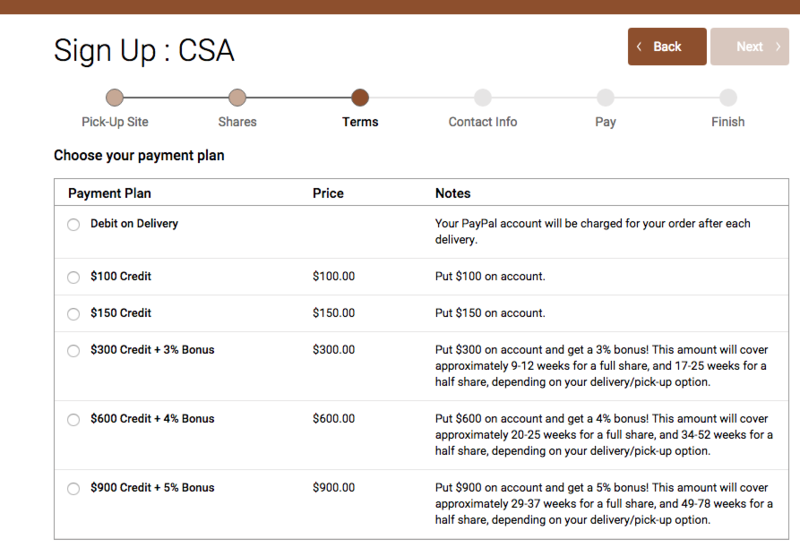 Follow Step 2 above to create the default store orders for your members' customizable shares. 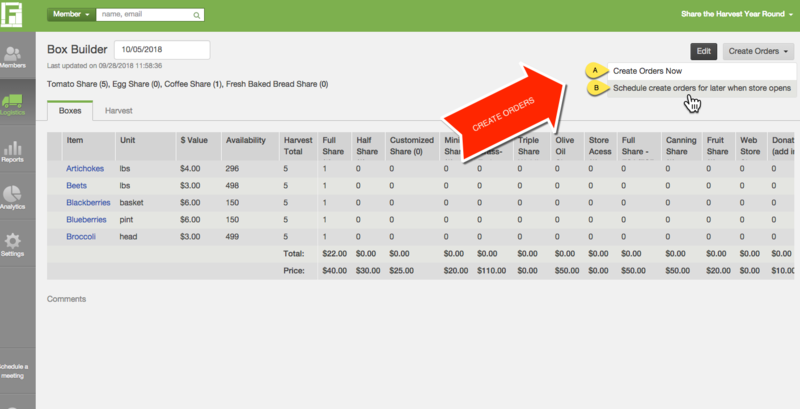 In this step, ONLY enter the contents in the Box Builder for the shares that you want to convert to store orders, i.e. for the customizable shares only. After the customizable store orders are created, remove the contents from all boxes in the Box Builder. Now define the contents in the Box Builder for the shares and options that are not customizable. Once the order window has ended for members to edit their store order, download the Sourcing Breakdown report.